Rose Hathaway's got serious guy trouble. Her gorgeous tutor Dimitri has his eye on someone else, her friend Mason has a huge crush on her, and she keeps getting stuck in her best friend Lissa's head while she's making out with her boyfriend, Christian. (So not cool). Then a massive Strigoi attack puts St. Vladimir's on high alert, and the Academy crawls with Guardians--including the legendary Janine Hathaway...Rose's formidable, long-absent mother. The Strigoi are closing in, and the Academy's not taking any risks. This year, St. Vlad's annual holiday ski trip is mandatory. What i thought: Just like the first in its series, this book was amazing. The crafting of this novel is just fantastic! Richelle mead definatly knows how to write a story, and the endings of her books all leave you hungry for more. Rose's character becomes even clearer throughout this book, and matures a lot. She begins to realize that she is going to be a gaurdien soon, and that it isnt just the fun and thrill of a fight; its a huge responsibility. Her love for Dimitri becomes much more dominent, and that itself simply enthralled me. the stunning conflicts that occur through this novel will have you gasping, and feeling a feirce need to comfort the harmed characters. Because Rose, despite how tough she seems, has battling emotions. . . and needs to have someone to believe in, to lean on. I think that these books are absolutely amazing! If you like PC/Kristen Casts thrilling House of Night Series, Vampire Academy seres is definatly for you. With a gripping plot, vampire-action, and forbidden romance, these books will have you from start to finish! But the series looks great! i know, right? the covers are wierd; the books are amazing! I have not read the book yet... I just finished the first one because of my amazing friend Emily. She was the one who started me on twilight, and now she has my heart pounding for these characters. Rose is amazing. I love her. I can not wait to read the next one. haha the ending of the third one is very depressing. 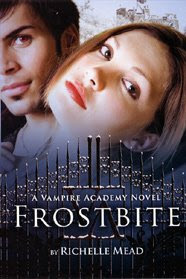 Vampire Acadamy is waaaaaaaaayyyyyy better than Twilight!!! want a book to be reviewed? To find out about my policy for receiving and reviewing books, visit the "Review Policy" page, or just send me an email at simplynerdybooks@aol.com.